Oral Roberts University, which recently held a conference to educate colleges and universities about blockchain, will be co-hosting two new one-day blockchain events, one on the east coast and the other on the west coast, to reach educators and IT leaders in both higher education and K-12. Both events are offering discounts to attendees from educational institutions. 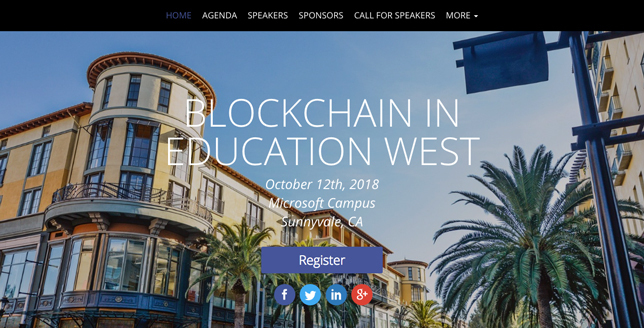 The Microsoft Sunnyvale campus will host the "West" edition of "Blockchain in Education" on Oct. 12; and the University of the District of Columbia Van Ness Campus will host the "East" version on Nov. 13. Participants will receive blockchain certificates produced by ORU as well as paper-based certificates of attendance. According to the agenda of the West Coast event, the conference will introduce blockchain concepts and explore how blockchain can be used in an educational environment. Speakers include Byron Clift-Breland, the chancellor of San Jose Evergreen Community College District, and Sudhir Wadhwa, a lecturer at Santa Clara University and chief technology officer for Viridis Learning, a company that helps students identify their career pathways and provides tools for helping them track and share their achievements. The agenda for the East Coast event will be announced soon; speakers include Feng Hou, CIO and chief digital learning officer for Central New Mexico Community College, and Loretta Early, CIO for George Washington University. "No college or university offers any training certificates, diplomas or degrees in any of the process-driven functions on campus. Therefore, everybody has been waiting for years to clean up the processes that takes days, such as financial aid approval, articulation, assessment," said Michael Mathews, vice president of technology and innovation for Oral Roberts University. "If you're tired of multi-day processes hindering student success, blockchain is a necessary technology to streamline broken processes."